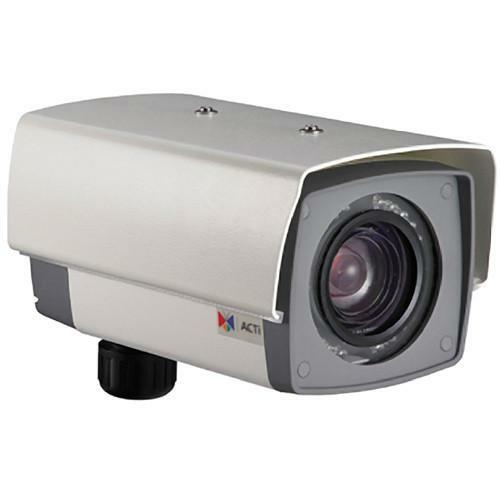 We recommend checking out our discussion threads on the ACTi KCM-5611 18x Zoom H.264 2 MP Day/Night IP Outdoor KCM-5611, which address similar problems with connecting and setting up Wired IP Cameras ACTi. The user manual for the ACTi KCM-5611 18x Zoom H.264 2 MP Day/Night IP Outdoor KCM-5611 provides necessary instructions for the proper use of the product Surveillance - Surveillance Video - Wired IP Cameras. The ACTi KCM-5611 18x Zoom H.264 2 MP Day/Night IP Outdoor Box Camera with ExDR provides excellent color sensitivity and high-quality images for both day and night applications. Offering resolutions up to 1920 x 1080, the camera provides clear and crisp images at 15 fps, thanks to the 1/2.8" Progressive Scan CMOS sensor. Along with MPEG-4 SP and MJPEG formats, this box camera supports H.264 compression technology that provides small-sized files and uses less network bandwidth. In addition to a built-in IR-cut filter that can be removed automatically at night, this box camera is equipped with IR illuminators to capture clear images even in total darkness. This makes the camera suitable for round-the-clock surveillance. The Motion Detection feature triggers an alarm when movement is detected in a designated portion of the video display. Privacy masking function (4 configurable regions) allows you to block certain portions of an image for security reasons. The Power over Ethernet (PoE) transfers both power and data over a single Ethernet network cable, eliminating the need to install the camera near a power supply. The IP66-rated, weatherproof housing ensures uninterrupted surveillance in exposed and high-risk locations. If you own a ACTi wired ip cameras and have a user manual in electronic form, you can upload it to this website using the link on the right side of the screen. Box Dimensions (LxWxH) 9.5 x 8.2 x 5.8"
The user manual for the ACTi KCM-5611 18x Zoom H.264 2 MP Day/Night IP Outdoor KCM-5611 can be downloaded in .pdf format if it did not come with your new wired ip cameras, although the seller is required to supply one. It is also quite common that customers throw out the user manual with the box, or put the CD away somewhere and then can’t find it. That’s why we and other ACTi users keep a unique electronic library for ACTi wired ip camerass, where you can use our link to download the user manual for the ACTi KCM-5611 18x Zoom H.264 2 MP Day/Night IP Outdoor KCM-5611. The user manual lists all of the functions of the ACTi KCM-5611 18x Zoom H.264 2 MP Day/Night IP Outdoor KCM-5611, all the basic and advanced features and tells you how to use the wired ip cameras. The manual also provides troubleshooting for common problems. Even greater detail is provided by the service manual, which is not typically shipped with the product, but which can often be downloaded from ACTi service. If you want to help expand our database, you can upload a link to this website to download a user manual or service manual, ideally in .pdf format. These pages are created by you – users of the ACTi KCM-5611 18x Zoom H.264 2 MP Day/Night IP Outdoor KCM-5611. User manuals are also available on the ACTi website under Surveillance - Surveillance Video - Wired IP Cameras.